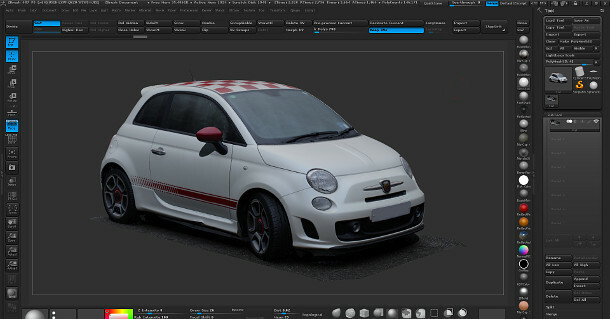 Ten24 has released a free 3D scan of a Fiat car as part of a new article on recreating vehicles with photogrammetry, posted on the firm’s 3D Scan Store site. The scan was created two years ago, using a single DSLR camera and Agisoft’s PhotoScan software, as part of the studio’s first attempt to recreate a car. Ten24 deliberately picked the most challenging model it could find – pure white, with decals – to test its workflow for scanning reflective surfaces. Ten24 plans to release a follow-up tutorial setting out its new techniques next year. The scan model is provided in both OBJ format and ZBrush’s native ZTL format – you’ll need ZBrush 4R7 or above to open it. It comes with a 10k texture map, although that’s really there for completeness: Ten24 notes that in most cases, you’ll need to rework the asset using shaders for the glass surfaces. The model is licensed for commercial use, but you’ll need to obtain the relevant rights from Fiat first.